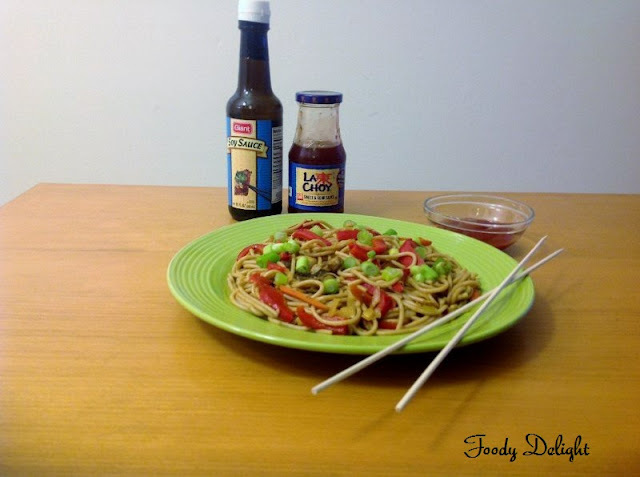 Lo Mein means " stirred noodles" is the most popular take out food in American restaurants. 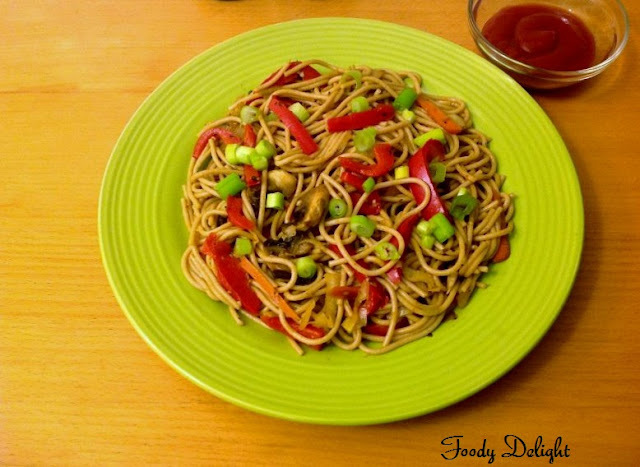 Lo Mein is prepared with a wheat flour noodles, stirred with sauce, variety of vegetables and other seasoning. Chicken Lo mein, shrimp lo mein, lobster lo mein and House lo mein ( more than one meat) are also available. Boil the spaghetti as the package instructions.When cooked drain and rinse with ice cold water.This avoids sticking of noodles. Wash the vegetables and cut them into lengthwise. Grate the ginger using fine grater. Combine soya sauce, sweet and sour sauce ,hot sauce, corn starch and salt in small bowl .Mix well. Place the skillet on high flame and add sesame oil into it. When oil heats up, add minced ginger, minced garlic and sliced onion. Stir well. Then add all the vegetables and combined sauce mixture. Cook till raw smell of sauces disappears, do not overcook,this will make vegetables to lose its crunchiness. Quickly stir in boiled spaghetti and stir fry for about 3 minutes. Chicken or any seafood can be used interchangeably in this versatile dish. The more we make this dish, the more ginger is added. Very simple meal.. BUT look so YUMMY to me.. I m hungry already. One of my fave food ! It looks delicious ! Simple and yummy one pot meal:-) Thank u for visiting my space and leaving such lovely words..Glad to follow u and stay tuned to more yummy recipes!